The basket can be later used keep things of regular use. The green fillers in this basket are seasonal in nature. The greeting card is a great home decor peoduct. There is a large rose bush that covers the wall of the Cathedral of Hildesheim in Germany for over 1000 years. Impress your dear one with something that can make him/her feels overwhelmed and loved at once like this wonderful flower and chocolate combo. 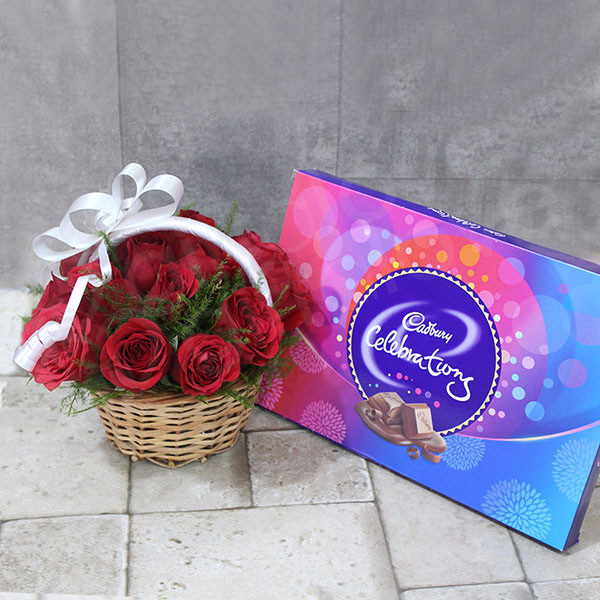 The beautiful red roses of the basket flower arrangement are sure to convey feelings of sheer love and chocolates will make him/her immensely happy. Order it, right here to give a heartwarming surprise to sweetheart.